Parents feel they have to take care of their kids, whether they are 9 or 19 years old. But as kids get older, they engage in more risky behavior, and “taking care of them” becomes more challenging. When they’re five, they’re climbing the monkey bars and you’re worried they’re going to break their arm. At eleven they’re starting to play football or baseball and you’re afraid they might get hurt with a piece of equipment. At 16, they’re starting to drive, they’re often getting money on their own, and they’re around people with drugs. On the surface, they may seem much more independent, but actually they are simply much more able to put their parents off and hide what’s really going on with them. Kids between the ages of 17 and 23 have a lot of thinking errors. Just like you can have a spelling error, and misspell a word, you can have a thinking error in which you misread life’s problems and come out with the wrong solutions. 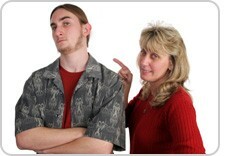 When kids start hitting their late teens, you’ll hear them saying things that indicate they see themselves as victims. “It’s not my fault.” “I couldn’t help it.” “I only stayed out an hour late and you want to punish me?” They become much more adept at manipulating their parents by blaming them for being too rigid and strict. You’ll hear kids say, “I’m getting older now. You should trust me more.” But the fact is, they’re not getting that much older. Teenage mentality lasts from early adolescence until 22 or 23 years of age. Most of the research shows kids are still using the same parts of their brain at 22 that they were using at 15. Their brain is still developing in their early 20’s. So they are not that much more prepared for adult situations. But parents can get sucked into the thinking error that “You owe me. You owe me a place to live. You shouldn’t be too rigid.” When parents hear this enough, they start to feel guilty for the rules by which they have chosen to live. They begin to think they’re too strict just for trying to implement the rules they’ve always had since their kids were young. I think parents should have two levels of rules with their older children who are still living at home. The first are the rules of your household that reflect your values, structure and moral authority. For example: People don’t abuse people around here. That doesn’t change at 18 or 19. That rule never changes. No drugs and alcohol, especially if you’re under age. That doesn’t change at 18 or 19. That’s the rule. No stealing. No lying. I would keep those rules very clear, because you don’t want to start having double standards with older kids, especially if you have other younger kids in the home. The second level of rules is the one that enables parents to live with young adults. Certainly, young adults should get more responsibility and independence, but they have to earn it. If you’ve got a job, you get more independence. Should kids be able to stay out all night because they’re over 18? Absolutely not. If they’re living in your house, they have to let you know that they’re okay. That may mean calling in if they decide to sleep over at someone’s house. You have a right as a parent to expect this. The most important part of having rules with older children is the discussion that establishes those rules. When a child is about to turn 18, parents need to have a serious discussion about what the rules are going to be in order for everyone to live together. It should be a sit down, and you should write everything down that you agree to so that everything is clear. What can you do? What can’t you do? How will we support you in what you can do? What’s going to happen if you do what you’re not supposed to do? What is forbidden? These things should be clearly spelled out. Everyone in the home should know what the rules are, and it’s important to lay it all out before the child turns 18. For example, the rule on drinking: “If you come home drunk, you will not be allowed to live in our house.” It can be you’re out of the house for a few days, a few weeks or forever. Just establish the rule, write it down and explain to the child that he is over 18, and this is how we have to live with this issue. If kids get belligerent and violent after 18 (or at any time, in my opinion) the police should be called. If you feel compromised and taken advantage of by an older child, you need to realize this: the child is an adult now. He may not act it, but he is an adult. He’s living under your roof. He has to follow your laws. I want you to think of your adult children as guests. Not as children. That’s the most important thing to do. They’re done with high school; they are now guests in your home. How would you let a guest act? When would you draw the line with a guest? When would you feel you have to call the police with a guest? When my son went to college, one of the biggest shocks he had was when we started to refer to his room as the guest room. I remember him saying, “But that’s my room.” We said, “No, that’s the guest room. You can stay there anytime you want, for as long as you want, as long as you live our way.” We said it with love and kindness, but we wanted him to see his role in a different way—as an adult. The bottom line is, sometimes kids have to start out small. There’s no shame in that, and you have to make that very clear. Even if it doesn’t match up with what you had hoped for your child. Many young adult children often have a false sense of entitlement. I met many kids in my practice who refused to go to school, and could only read and write at a seventh or eighth grade level at best. They told me they were going to be video game programmers, basketball players or rap singers. That’s how they were putting off their anxiety. If you’re talking to a kid who says, “I’m not making it in school, but I’m gonna be a rap singer. I wrote a few songs tonight,” that’s the way that that kid is postponing his anxiety. What he’s really saying is, “I’m so scared about the future, I have to make up this fantasy, and then I’m gonna cling to it.” Then, if you challenge that fantasy and say, “Wait a minute. There’s 20 million kids out there. What makes you think you can do it?” the kid says, “You don’t believe in me. You don’t have any faith in me.” He turns it right around on you until you’re the problem. His not studying is not the problem. You’re not believing in his fantasy becomes the problem. When you have these different currents coming together in a home where parents are living with an older child, it can get very uncomfortable for everyone, if not hostile. The way to keep that hostility at bay is to have clarity beforehand. Get the expectations and the consequences down on paper–literally. Write them down and expect the child to live by them. I have known many parents who couldn’t get their adult children out of bed. They think that they’re helping their adult children by giving them a roof over their head and not making them be responsible because they’re afraid for their kids. But what they’re afraid of can only be cured by that kid getting out of bed and doing something for himself. The parent is afraid the child is not going to amount to anything, that he’s not going to find a good job, that he’s not going to make it in school, that he’s going to get into trouble socially. But the thing that addresses those fears is to get him up at eight o’clock in the morning and get him out there looking for a job. Tell him to leave with his lunch, a cell phone and the internet want ads and don’t come back. This may sound harsh. You’re pushing someone out into a world that they have to deal with. But you’re not pushing them out of a plane without a parachute. You’re pushing them out into the street without any money. The solution to that problem is getting a job. Many times parents use their own fears, anxieties and sense of guilt and remorse to justify not doing what they would do to a guest. Out of fear, they choose not to expect out of their child what they expect out of themselves and each other every day. (Part 1 of a 3 part series. Please also see “In Response to Parents of Older Children” and “Rules, Boundaries and Older Children: Is it Ever too Late to set up a Living Agreement?” .